A new film about Skip Play Repeat will form part of a this event at The Continental in Preston on 5 July. 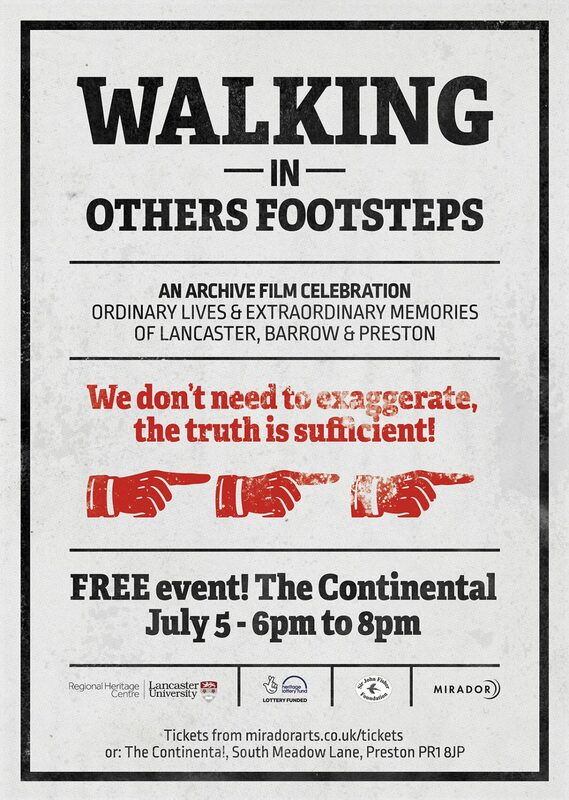 Walking In Other’s Footsteps is a free event from 6-8pm that includes rare archive film footage of Preston, Morecambe and Barrow, an interview with Dr Elizabeth Roberts and a screening of a newly commissioned film ‘Give Me Today, Anytime’. Walking In Other’s Footsteps is a Mirador Arts project which reveals the extraordinary content of one of the UK’s most important collections of oral history – The Elizabeth Roberts Working Class Oral History Archive. Mirador invited artists to respond to this ground-breaking archive to create new works for Preston, Barrow and Lancaster and this is an opportunity to find out what we’ve been up to. The event is free but you need to book. It’d be great to see you there!